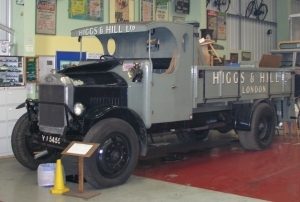 The chassis of this vehicle was supplied new in Summer 1927 by Dennis of Guildford to London based builders Higgs and Hill Ltd. The body was built at the Company's own workshops in Vauxhall, south London, the vehicle entering service in November 1927, replacing one of a batch of older, ex War Department, Dennis lorries that had been bought after the 1914-18 War. It was sold by the Company in 1942, for £ 35, having travelled in the region of 250,000 miles . Its later history is somewhat patchy, but it was eventually used by Smith Clayton Forge in Lincoln to move castings around the works, its rear springs being replaced by one piece steel beams. YU 5455 was acquired by the Lincolnshire Vintage Vehicle Society in the late 1960's in very poor condition, with a replacement non-original radiator and devoid of such things as the copper water pipes and carburettor. It was extensively restored by Higgs & Hill at their plant workshops in Wellingborough between 1972 and 1974, for use in 1974 as part of the Company's centenary celebrations.